I’ve shared my love for a good email newsletter in the past. Until recently, most of my favorites have been put out by single publishers. Bloggers and writers who use email as an extension of their own web site. But this past week I’ve seen what I’d consider the very best use of email I’ve ever experienced. It’s the Daily Obsession from Quartz. 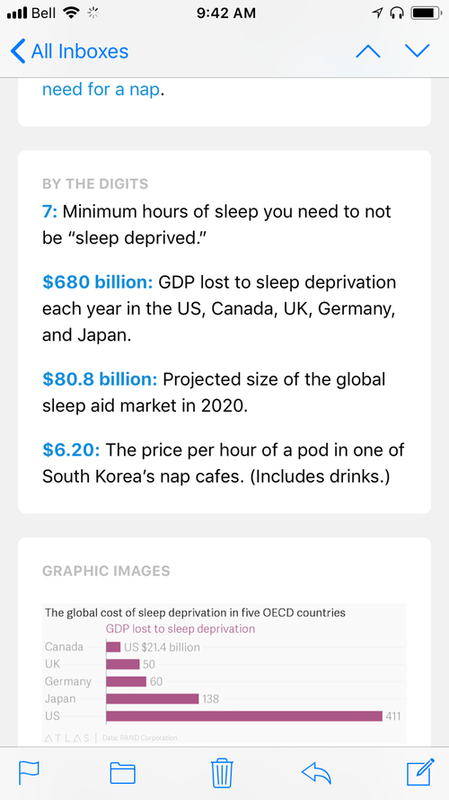 For a little context, the team at Quartz has been putting out one of these daily news-around-the-globe emails for a while now, titled the Daily Brief). It’s similar to other options like the Economist’s Espresso or Dave Pell’s Next Draft. I’ve subscribed to it on and off over the past couple of years and it’s well done. It provides bite sized summaries of recent events and the best part is the writing is clever and full of wit, but without alienating the reader. It’s hip. But this past week, the Quartz team launched something new. It’s an afternoon newsletter that, rather than summarize a bunch of topics, goes deep into one topic. It’s the Daily Obsession … and it is so very well done! Each email is broken into several sections, somewhat like The Weekly Review. Each one has a quiz near the beginning, a poll near the end, several stats that give insight into the topic, and of course, there is a lot of information and external links for those who want to read more about the topic. It’s the perfect form for 2017. The email itself is about the length of the daily brief, but each section on its own is short and sweet. Brevity still rules the day here. You can quickly move from one section to the next, each slightly changing the focus of what you're learning about the subject at hand. In all, you can read through one of these in just under 5 minutes, but come away with a better awareness of the email’s subject than you had going in. 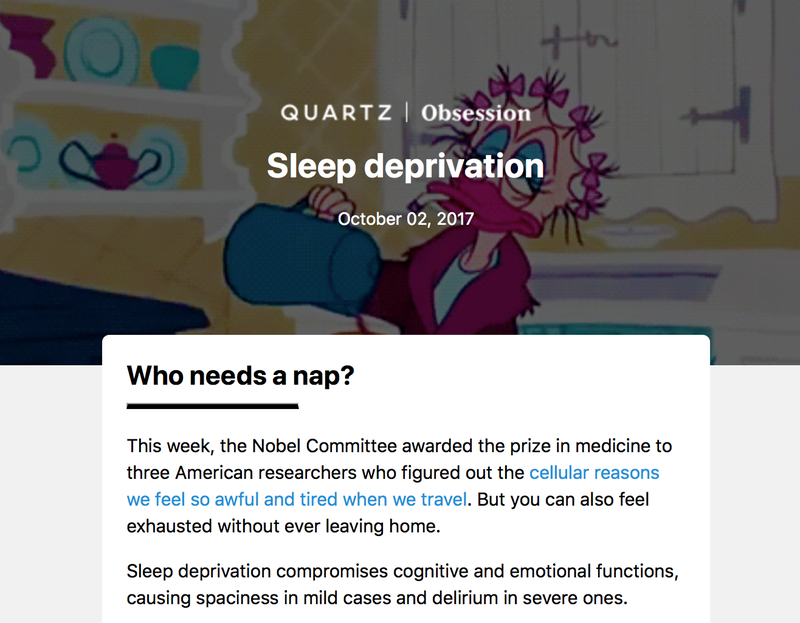 Excellent writing, good stats, clever headlines, funny GIFs, links to related videos … Quartz has nailed the perfect combination of content that fits today’s readers. Most important to me is the writing: if they nailed all the rest but the writing fell short, the entire idea would fizzle. But the writing is the glue that makes this newsletter so special. From the pre-header to the footer, the Obsession is filled with copy that makes me feel raging envy. It’s like the team has their finger on the pulse of what is hip and have perfected their delivery. Subscribe and see for yourself.